Although it has been around for over five thousand years it is still a mystery why Newgrange was built. Situated in the Boyne Valley in County Meath, Newgrange is older than Stonehenge and The Great Pyramids of Giza. It is recognized as an Ancient Temple, with spiritual, religious and ceremonial importance. The structure itself is kidney shaped and covers an area of approximately one acre. There are many other mounds in this area and they are known collectively as Brú na Bóinne (Irish for Newgrange). Two of the other mounds called Knowth and Dowth, are similar to Newgrange and they have been designated a World Heritage Site by UNESCO. Newgrange was built by a society of Stone Age farmers. Although not a lot is known of them or their community the amount of time invested in the construction of Newgrange suggests they had specialized groups with skills in different aspects of construction. The project would have taken years to complete and it is guessed that it was passed down through the generations. As Newgrange was built to align with the rising sun, each year at dawn the light floods the chamber and passageway on the shortest days of the year. The event is completely dependent on whether or not the sun shines but this does not stop people gathering to witness this truly remarkable feat of engineering. To decide who enters the chamber each year a lottery is held to select the people who will be lucky enough to experience the rising sun surrounding them with light. The solstice only lasts for a few days and occurs as the sun rises hitting the chamber with an impressive display of light. During the year the Visitor Center puts on a mock sunrise as part of the attraction for tourists. To enter the chamber you pass the Entrance Stone with its gothic decorations and above the entrance there is an opening called a roof box. The purpose of the roof box is to allow the sunlight to filter in. The spectacle of sunlight penetrating the chamber can last for up to seventeen minutes as the sun gets higher in the sky. 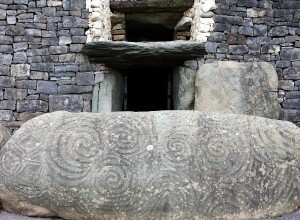 It is believed, but not proven, that Newgrange was built to celebrate the coming of the New Year.